Samsung has just unpacked the new Galaxy S9 and Galaxy S9+ flagship duo in Barcelona. The new devices are helming Samsung's 2018 smartphone portfolio with new hardware but old looks. Both S9 and S9+ retain the familiar glass-sandwich design with water-proofing, aluminum frame, curved Gorilla glasses, and everything. Samsung has trimmed the screen bezels a bit and thus both phones have smaller footprints than their respective predecessors - if insignificantly so. The minor changes in the design include a well-hidden iris scanner, a properly placed fingerprint reader, and a changed grille for the bottom speaker. The Infinity Super AMOLED screens are here to stay, both with Quad HD resolution. The Galaxy S9 has a 5.8" big screen, while the Galaxy S9+ opts for a 6.2" unit - just like last year. Samsung promises even deeper blacks than before, whatever that means for an OLED screen. Both the Galaxy S9 and S9+ will run on the latest Exynos 9810 everywhere but North America and China. The new SoC has an octa-core processor with a quartet of third-gen Mongoose cores at 2.8GHz and a quartet of Cortex-A55 at 1.7GHz. 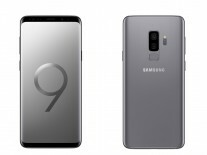 There is an 18-core Mali-G72 GPU and 4GB (S9) or 6GB (S9+) of RAM. The latest Qualcomm chipset - Snapdragon 845 - will power the duo in North America in China. It has an octa-core Kryo 385 processor, Adreno 630 GPU, and the same RAM - 4 gigs for the S9 and 6 gigs on the S9+. The camera is where the new Galaxies have seen the biggest lift. The 12MP main camera on both phones is now capable of variable aperture - you can choose between f/1.5 and f/2.4. There is optical stabilization, and dual pixel phase-detect autofocus. Unfortunately, the LED flash is staying single for another year. The selfie shooter is borrowed straight from the S8 - an 8MP one with f/1.7 lens and autofocus. 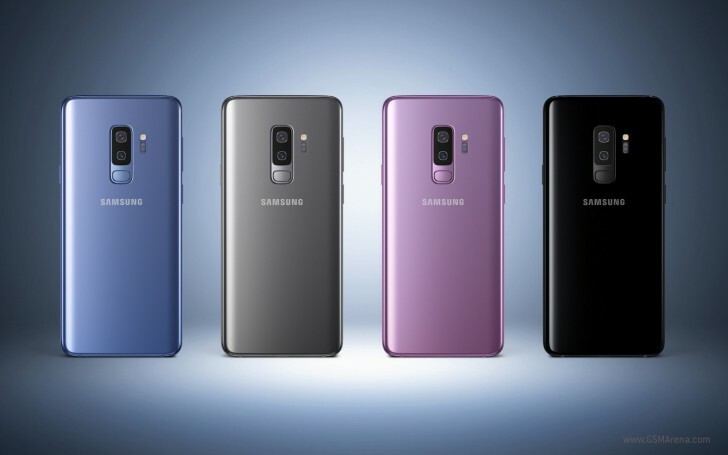 The Galaxy S9+ is exclusively getting a secondary telephoto camera - the same as on the Note8. It's a 12MP sensor with f/2.4 lens, OIS, and dual-pixel AF. Both smartphones support 4K at 60fps capturing in the new HEVC format, as well as 720p slow-mo recording at 960 fps - just like the most recent Sonys. One major difference between the Xperias and the Galaxy S9 smartphones is the automatic event detection - no more hit and misses of those precious moments. The slow-mo has a quicker cool down time, too, now it's just 2s. And finally, Samsung offers easy editing of those clips, including one-click gif export. Finally, both Galaxy S9 and S9+ come with a premium AKG by Harman stereo speaker setup with Dolby Atmos support. Samsung says those are 40% louder than the S8's speaker. The S9 duo runs on Android Oreo with the latest Grace UX. There is new support of AR Emojis, improved KNOX, and Intelligent Scan security making use of the iris scanner and face unlock at the same time. The batteries of the Galaxy S9 and S9+ are the same as on the S8 and S8+, no updates here. 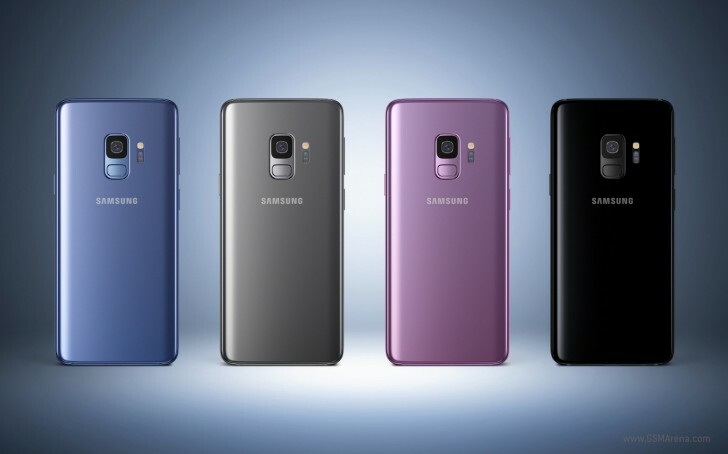 Samsung Galaxy S9 and S9+ will launch next month in Midnight Black, Coral Blue, Titanium Gray, and Lilac Purple. Pricing, promotions, and exact availability is yet to be announced. I understand. It's not an easy task to stay unique with that trend of bezelless thingy. Think about it. It looks like every other samsung or lg phone and that is the problem I have with it.